TAIPEI (Taiwan News) -- Taiwan has been ranked 1st in quality of life and the 2nd best place for expats overall in InterNations' Expat Insider report for 2018. In the report's Quality of Life index released yesterday (Sept. 6), Taiwan reclaimed its throne from 2016 at 1st place. Taiwan is rated especially high for its affordable health care at 96 percent and personal safety at 98 percent. Taiwan's "affordable, multi-faceted healthcare system" greatly impressed expats from the U.S. as well as many other countries, according to the report. Under the major categories listed for quality of life, Taiwan was ranked 3rd for personal happiness, 5th for travel and transport and 5th for health and well-being. 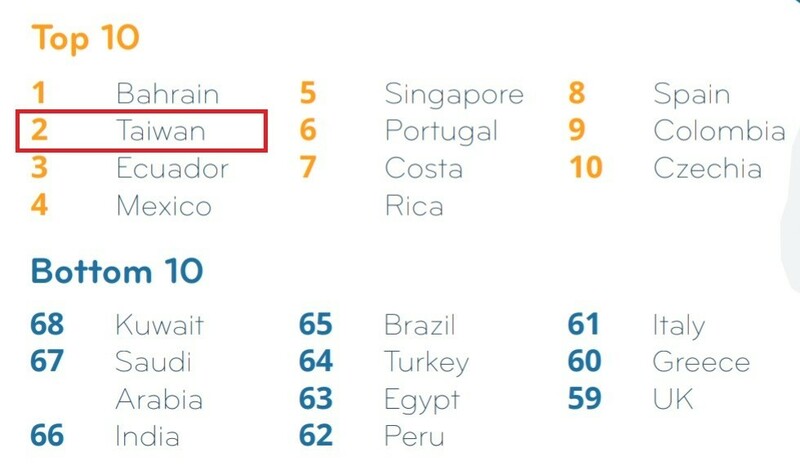 Overall, Taiwan was listed as being among the 3 expat destinations that were "breakout stars" in this year's report, just behind Bahrain and ahead of Ecuador. After a 4th place finish in 2017, Taiwan is back among the top 3 with a 2nd place standing out of 68 destinations in this year's list. InterNations said Taiwan led all countries for its quality of life with a "staggering" 96 percent of respondents giving its affordable healthcare high marks. An even higher 97 percent said they were satisfied with Taiwan's transportation infrastructure. Taiwan has also climbed from 12th in 2017 to 2nd this year in the Working Abroad Index. Over 76 percent rated job security favorably, 76 percent reported a high level of job satisfaction, and 73 percent gave Taiwan a positive rating for work-balance. Expats in Taiwan surveyed also reported much less time at work per week (39.9 hours) than their global peers (44.0 hours). Although incomes are reported to be lower in Taiwan, with 70 percent reporting a gross household income of less than US$50,000, 79 percent say that they are "generally satisfied with their financial situation." Taiwan also received high marks for friendliness (3rd) and ease of finding friends (8th). However, a whopping 58 percent find learning the local language to be hard. Given the language barrier, 27 percent say they find living in Taiwan difficult without a grasp of the local language. The language barrier also translates into only 28 percent of parents sending their children to local schools, while 30 percent choose international schools and 24 percent pick private schools. As for home schooling, 8 pe​rcent chose this option, twice the global average. Men and woman both rate Taiwan highly favorably, with the country taking 3rd place among women and 4th among men. In terms of availability of eduction, Taiwan ranks in the middle of the pack at 21st out of 50 and 23rd for affordability of education and healthcare. Taiwan ranks 10th for the level of happiness expats report for their family well-being. The survey base for the report consists of 18,135 expatriates, representing 178 nationalities living in 187 countries or territories across the globe.